• Since the first slippers shown on slmen a month ago, Akeyo released 6 more colors/patterns. Discover today the last colors offered, grey, black and white. They are moddable by menu, the new script modifies both shoes at the same time, which is a great for the customer and makes the fitting totally easy! 320 Lindens per color, copy. 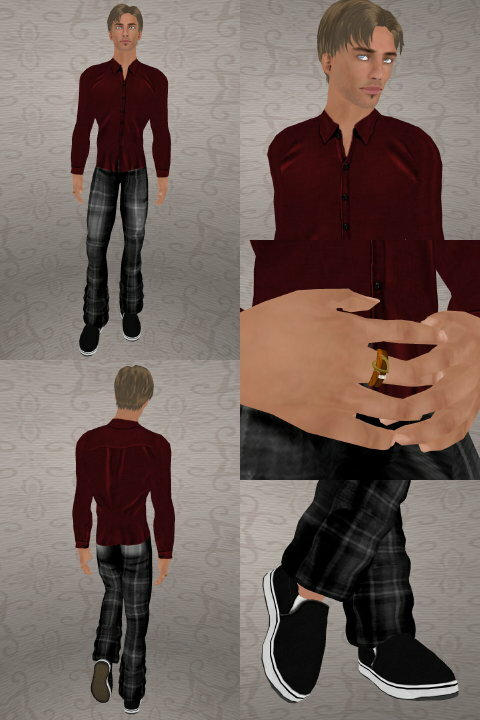 • I’ve a thing for plaid pants for men in SL, maybe because we are not used to wearing them here in France. I like the subdued tones of these ones from Raven Lament. They are offered with sculpty cuffs. Ok, sculpties are good! but OMG such a pain to fit them right following the pattern of the plaid! Fortunately, the pants are very well done and can be worn without the sculpties, they don’t show jagged cuffs (this is a SL bug, but careful designers know how to avoid it). They come in 6 colors (4 shown, plus blue and light grey), they are moddable of course, and copy-no transfer. You can pick your favorite color for 100 Lindens or get the whole pack for 450 Lindens. Showing Akeyo Slippers in Black, Dan Senyurt Velvet in Kirsch red, Ravenwear Academic in Dark Grey, and PE Kai hair in Ash Brown. Akeyo Slippers in White, Dan Senyurt Rocksalt Buttoned Henley, Ravenwear Academic in Green, and PE Kai hair in Natural Red. • I’ve shown Dan Senyurt’s shirts and henleys for a long time on slmen. They are nicely designed with great attention to quality. Items are multilayered, often come in open and closed versions, and a great choice of colors is offered. I wish maybe some patterned shirts and a bit more bright colors; well simply a little more fun! I also wish Dan Senyurt offered moddable items. It’s less important when it’s about shirts worn without a jacket (otherwise they wouldn’t show on slmen at all), but there is no reason to deny customers fine tuning what they buy. The best designers in SL set their clothing items modify, are they all stupid? Too bad, because Dan Senyurt can make clothing items with the best you can find in SL. See price scheme and perms on the credit. • Another ring from Mhaijik Guillaume. It offers fine prim work with many details you can discover only when zooming on it. I love the little golden heart on this one, made of leather, earthquartz and metals. Gold is shown, silver is available. These rings are done to match the heart necklace released last year (shown here, here, and here, among other!) Ring and necklace could be beautiful sober and thoughtful gifts for Valentine! • Rocksalt Buttoned Henley - Suede Blazer Black, SF Designs Tartan trews red, Carl Perkins Suede Shoes in White. • Coltsfoot Buttoned Henley, SF Designs Buccaneer punk pants, Carl Perkins Suede Shoes in black. Well, plaid shirts are SO difficult to design, I wanted to show you these oens, they are pretty and come in many colors. Dan Senyurt does only shirts for now, and he does them very well. I show the pistachio green one with the subtle “green” low rise Jeans by Canimal Zephy. To enhance the outfit, some jade in the eyes (by Nephilaine protagonist) and on the wrist, with a bracelet by Mhaijik Guillaume. You can pick your color packs for 175 Lindens each, including an opened version on the jacket layer, a closed version on the jacket layer, and a tucked version on the shirt layer. After the jump, take a look at the other colors I like!